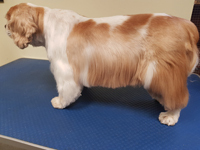 Here at The Albavet Groomers in Burntisland we are delighted to welcome your pet to our pampering studio. 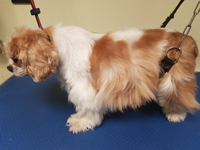 In our spotlessly clean studio, Jemma Reekie, our highly trained professional groomer who has over 10 years of experience and specialises in working with nervous dogs, is fully equipped with the latest technology, products and techniques to make your dog look its absolute best, whatever its coat type. We’re very friendly, relaxed and love our clients! 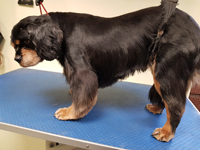 That’s why we’re dedicated to making sure your dog enjoys their grooming experience. Monday to Friday 9am – 5pm by appointment only. Make an appointment today by calling 01592 871333. 10% discount for all Healthy Pet Club members. 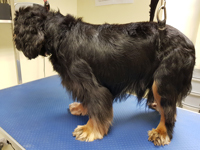 We also offer hand-stripping, ear cleaning and nail trimming treatments – just ask for details. For more information and prices please contact our Burntisland clinic on 01592 871 333.